The top female player from India and one of the best women players in the world, Humpy Koneru has stood out in the chess world. At the time she became a Grandmaster, she was the youngest female in history to be awarded the title. She won many girls youth championships when she was young and has continued this success throughout her life. Even though she has not yet won the Women’s World Championship, she will surely continue to challenge Judit Polgar and Hou Yifan for the title of strongest female player in the world. 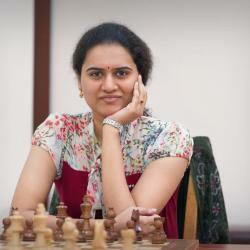 Humpy Koneru learned to play chess from her dad at the age of 5. In 2001, she won the World Junior Girls Chess Championship and around this same time she got the Woman Grandmaster title as well. In the next year, 2002, she was awarded the official Grandmaster title, the youngest woman in history to become a Grandmaster at the time. In 2006 and 2009, Koneru played in the Women’s World Championship but lost in the second round and semifinals each year. She continued to have great success when in 2007 she passed Susan Polgar’s 2577 rating to become the second highest rated female chess player in history. Later that year she also became the second female player in history to break the 2600 rating barrier. She is now ranked as the third best female in chess, behind Hou Yifan and Judit Polgar. Despite never having been able to win the Women’s World Championship yet, she is still one of the top women players in history.